Seb Goldswain and Jane and Paul of Inter-Alia will perform in Botha’s Hill on May 20. At the age of 24, Goldswain is already being considered by many of South Africa’s elite professional musicians as one of the top performing guitar players in the country. He is a highly versatile musician, having studied Jazz guitar and Composition up to Honours level at UKZN, and apart from performing with his own original electric band, and regularly working with some of SA’s top established artists, he also performs his own highly energetic original solo acoustic set to wild reception. He is proficient in bluegrass, blues, funk, heavy rock, country and Jazz styles, and encompasses these styles, as well as a wide range of artistic influences, into his original electric material. He has performed internationally in Austria, Greece, the UK and the United States, and has performed his original music at many of South Africa’s top music festivals including Splashy Fen, White Mountain Festival, The Grahamstown National Arts Festival, Standard Bank Joy of Jazz Festival, The UNISA International and Andrew Young Jazz Festival, The UKZN Youth Jazz Festival and the Durban International Blues Festival. 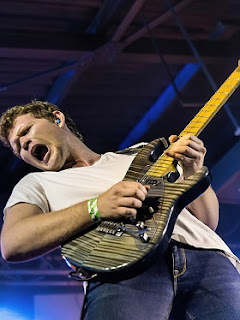 He has also worked and toured with international artists George Ezra, as well as many of South Africa’s most highly recognised artists including Ard Matthews, Matthew Mole, Beatenberg, Albert Frost, Dan Patlansky, Lloyd Cele, Kahn Morbee from The Parlotones, to name a few. Inter-alia comprises well-known husband and wife team Jane and Paul with 30 years of experience on the professional music scene. They will be performing hits by Stevie Nicks, Lucas Graham and Santana. From soaring ballads to powerhouse rock and everything in between celebrating 70 decades of music from the 60’s to current day. The performance takes place on May 20, 2018, at 11h30 (gates open 11h30) at Lindisfarne B&B Garden Concert, 32 Chapel Road, Botha’s Hill. Tickets R100. Bring picnic basket – umbrellas, blankets or chairs to sit on – some warm clothing, it can get chilly.